In all there are 44 multihulls sailing under the ARC banner this year - 30 on the direct route and 14 sailing with ARC+ showing the growing popularity of the spacious alternative to monohull cruising. Mainly berthed in 'Cat City' the Vela Latina area of Las Palmas Marina the cruising cat owners have created a community of floating hotels, enjoying the comfort of spacious saloons and cockpit areas.28 catamarans and 2 trimarans will leave the the ARC fleet on Sunday 19th November and the most popular catamaran brand is Lagoon, with 10 entries overall including 3 Lagoons 42s. The smallest multihull, but certainly not the slowest, is the Dragonfly 35 Ultimate Flying Merlin from Switzerland. When considering buying a boat, owner Martin Kottmann realised that half of his sailing life had been spent under motor. So, he opted for a fast Dragonfly that doesn’t need more than 6 to 8 knots of wind to start “flying”. His girlfriend’s wish for upright sailing was also fulfilled. Another advantage of the trimaran, the swing wing system allows the floats to hinge inwards to meet the centre hull, reducing the beam of the boat from a massive 8.20 m to 3.85 m.
Kallima is a Catana 42. Wayne Camamile who is Australian, but owns a diving school in Berlin, diligently prepared her for double-handed sailing. Nothing was left to chance; everything was checked and rechecked again. Although Wayne arrived in Las Palmas two weeks before the start, he hasn’t had time to see much of Gran Canaria. He’ll make up for that next year, he says. Together with his friend Tom, he is looking forward to a fast crossing. Very often catamarans are chosen by families with children, like the Lagoon 42 Vega from Norway which became the new home of the Sand family. Parents to three children, Mum Guri worked as a TV Journalist whilst her husband Oddvar was an airline pilot. Around a year ago he found the sight in one eye had partially gone. His vision never fully returned and suddenly continuing with his career was out of the question. Responding to their change in circumstances, Guri and Oddvar realised that their long-held dream of sailing around the world as a family might be possible much sooner than they had expected. In the months since, the family have already achieved a huge amount preparing for the adventure. They took delivery of their Lagoon 42 Vega in May of this year, and Guri, Oddvar and their children Viljar (3), Askil (8) and Sigri (11) moved on board. During the summer they sailed down the Portuguese coast and finally arrived at Las Palmas. As part of their family sail, Guri and Oddvar will teach their own kids and have developed a cooperation with teachers at Vik School to enjoy a collaborative virtual classroom. Another multihull is Amuse, an Outremer 45. Jenny and Niall have been sailing for a long time - in fact their honeymoon in 1984 was a cruising holiday in Cork, Ireland! Unusual for most husband and wife sailing couples, Jenny is the skipper, enthusiastically aided by Niall, and they are aiming for a carbon neutral approach to sailing round the world. They have four adult children, Daniel, Naomi, Rachel and Molly who will join them on board their Outremer 45, Amuse, for parts of World ARC, but they will be sailing the ARC double-handed. Austrian Outremer Light 64 named Saudade is the largest catamaran sailing with the ARC this year at 19.5m and her owner Christof Petter is a familiar face to the rally. Previously, his Akilaria 40 Vaquita has had significant success as an out-and-out racer; in 2012, the Class 40 took line honours with a 12-day crossing which was just shy of the course record at the time – a remarkable feat for a 40-foot boat. On board with Christof this year are Olympians and Volvo Ocean Race veterans, including Nico Delle Karth (49er 4th at the London Olympics, multiple Vice-World Champion 49er) and Udo Moser (Melges 24 World Champion, Volvo Ocean Race 2008-09) who both sailed as part of the 2012 crew. 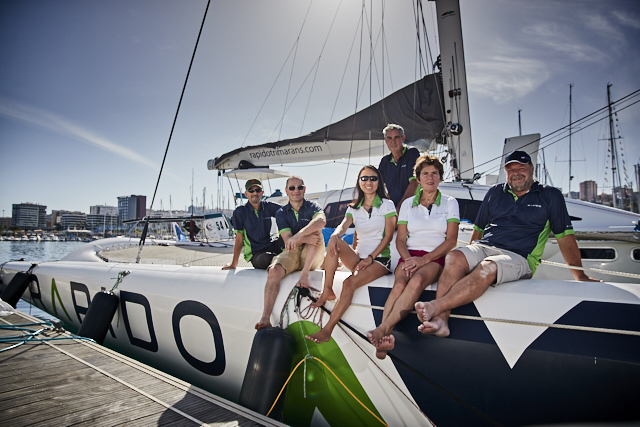 They’ll be one to watch to top the Multihull Division in this year’s ARC. Rapido is the first trimaran built in Vietnam. Designed by Morrelli & Melvin as an owner operated ocean cruising trimaran that is simple for a couple to sail, the Rapido 60 looks set to make waves in the ARC. Offering the shallow draft advantages of a catamaran - the Rapido 60 is only 0.75m when the rudder blade and dagger board are retracted. Combined with the speed and upwind ability of a trimaran, the Rapido 60 is part of a new wave of crossover trimarans, lead by Dragonfly and Neal. With the right weather conditions Rapido will want to try for the existing ARC Multihull record, and perhaps even give the racing monohulls something to worry about! The biggest catamaran is Moose of Poole, a Lagoon 620. With three decks, one above the other, the boat looks more like a hotel than a yacht. And indeed, it is used for luxury charter. 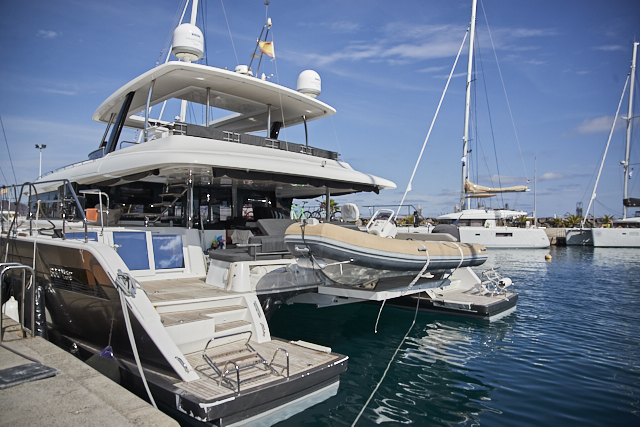 The 62ft catamaran features innovative design, while utilising both light and space, inside and out. Accommodating eight guests in four double en-suite cabins, there is plenty of space for everyone.